Customizable surround software let you shape the sound - Download the SENNHEISER SURROUND DONGLE SOFTWARE by visiting our official website. When we think about sound and how we hear, the sound generated from standard headphones which are produced near the ears and not from the speakers around us, the audio can sometimes have a detached quality. To some listeners, there is a separation between the actions in a game or happening on the TV screen and the sound entering the ears. This is a fundamental problem that surround sound headphones need to work to remedy. Real surround sound headphones will feature multiple tiny speakers that broadcast sound at different angles, in contrast to virtual surround sound which relies on two speakers and computes complex sound equations to simulate the effect of multiple directional speakers. High-quality surround sound headphones will be in the same spirit and follow the same basic philosophy as surround sound, loud speakers. They actually use numerous discrete speakers placed within each of the headphone cups that. The very early surround sound models offered 4 channels sound, but now, virtually all models offer the now 5.1 or 7.1 surround audio. With this kind of technology, these headphones counter the problem of unnatural or detached sound. With the ability of sound to enter the ear canal from various angles, the audio will no longer be heard to be artificial as you can experience with standard headphones. With the advances in virtual surround sound, the same effect is achieved through a few artificial means. With virtual surround, the headphones have two distinct speakers – one for each of your ears. 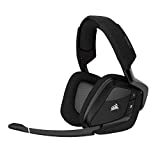 The virtual surround sound headphones rely on either internal electronics to translate the typical stereo or true surround sound signals into a virtual surround sound experience. These electronics rely on math and computer algorithms to segment signals into separate, smaller elements. Though the sound still enters the ear from the two speakers, it is changed in such a way that it appears to be coming from many more directional sources. Most high-end headphone manufacturers have their own secret sauce methods and algorithms for achieving the best possible virtual surround sound. On a basic level, these headphones redirect sound coming from the headphone speaker so that,they are able to hit the outer edges of the ear and roll into the ear drum over a period of time. Similar to true surround sound, these soundwaves will sound to be coming from various angles, avoiding that sensation that the sound is just coming from directly within your head. Of course, there are Pros and Cons to both types of surround sound headphone technologies. In theory, real surround sound headphones offer a better surround experience given that they actually have drivers for each channel. 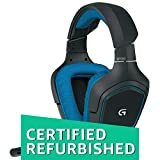 This is very useful for gamers like people who play CS:GO, Halo, or Call of Duty where the positional sounds can enhance your playing abilities. 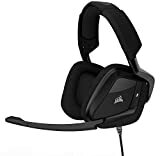 On the flips side, the disadvantages of using multiple drivers and surround sound processing while trying to maintain a reasonable cost for consumers can make the build quality sometimes inferior to the virtual surround sound headphones. Virtual surround sound headphones usually have the benefit of lower cost. Since its mostly electronics doing calculations, the addition savings can be shifted to producing better build quality and better individual drivers. In the end, both forms of surround sound headphone have a hard time living up to the best fidelity made by a physical surround sound set of speakers. While multiple speakers in the earcup or better processors can replicate the experience of surround sound fairly closely, they cannot completely recreate the sense of distance nor the range of tones created by high-end, larger speakers. That being said, if you are a gamer or your family is all up in your business all the time, then concessions must be made for privacy, cost, or saving space. If you setup a full 7.1 surround sound system then you are in for some serious dough and serious space requirements. These are simply are not viable for many situations or certain listeners. In that case, surround sound headphones are a great alternative. And as the technology grows and expand, the gaps between multichannel surround sound systems and surround sound headphones will continue to shrink. FULL-BLAST AUDIO: THE COMPLETE SOUND EXPERIENCE. Powered by advanced Dolby technology, these 7.1 surround sound headphones position you in the center of an immersive 360-degree sound field. They let you hear every detail in every direction, just as the game developer intended. Enemy fire. Sirens. Your opponent’s footsteps. When you hear what you can’t see, you win. Using Sennheiser PC 363D surround sound gaming headset is not about hearing the action, it’s about being in the center of it. A 7.1 surround sound experience is delivered by Dolby® Headphone technology to provide realism and directionality. Sennheiser’s “Eargonomic Acoustic Refinement” technology channels the sound directly into your ears for an exceptionally accurate frequency response. Combined, these two performance features are perfect for the non-compromising PC player looking for extreme immersion and a competitive edge. The PC 363D features an over-ear design with XXL velvet ear pads for extreme comfort during long gaming sessions. The professional-grade noise-canceling microphone provides crystal clear communication and automatically mutes when lifted. The Ultrasone Pro 900 is the very first model from the range of PRO headphones to have the S Logic Plus technology, a technology which basically does not only give the customers a lifelike and a high quality acoustic experience, but also makes it a lot safer and enjoyable. Design wise, the Pro 900 looks great like all Ultrasone headphones. It has silver and velvet black ear pads, aluminum nameplate and the headphones are closed back, foldable and weigh about 295 grams. It comes with an ultra-soft cable and a neutrik connector. One of the biggest drawbacks of the Pro 900 is its high price being one of the top models the company has to offer. 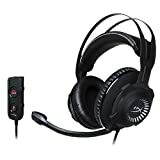 The first consideration that you’ll probably have to make when you plan on purchasing surround sound headphones is to identify on which electronic device you should mainly use it for. It is no surprise that the common answer will be for music but other than that, it can also be great for mobile phones, Skype, computer games, or HD movies. Before anything else, check out this discussion below regarding the style of headphones that are ideal for the situation. Unlike the Bluetooth in-ear headphones, the headphones for gaming need to have an accurate sound quality that is complete with a noise cancellation feature. The most common style needed to optimize the bass-driven stereo sound and catch all the audio is an overhead one since that type can enhance the overall gaming experience. If you want something to use for your music entertainment then it can be the one that is similar to the gaming type. The headphone types in this category are available in several designs and styles that can cater to any music of your choice. If you are the person who’s always on the go then perhaps an in-ear headphone should be great since they have a high attenuation of ambient noises. 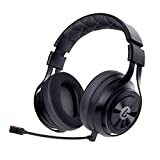 But if you prefer on listening to music at home then overhead ones are perfect since they have a full earmuff buds that can provide you with an exceptional sound quality. You can also consider purchasing the one that comes with a Bluetooth technology since it will help you eliminate the need for any wires. If you want to use the headphones mainly for audio recording or monitoring purposes then purchase the one that has special earmuffs. For this type, you will be presented with a rotating cup that is covered in foam thus increasing the noise-cancellation feature and level of comfort. This will be perfect if you plan on putting them on for quite a long time. There are various types and each one is most suitable for a particular occasion. So make sure to consider the perfect one carefully to ensure that the experience that you’re looking for will be delivered to you. So if you now have the buying urge, you should have a better idea on which headphones are the best ones to get.